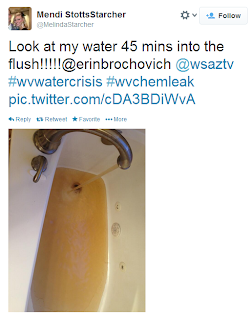 West Virginia Chemical Spill Coverage (Part 2) - Why it happened? Update(1-17-2014): WV American Water has declared the water system to be entirely safe. However, many local doctors are saying otherwise. Because of the continuing developments, part 3 of my article has been delayed to the weekend. 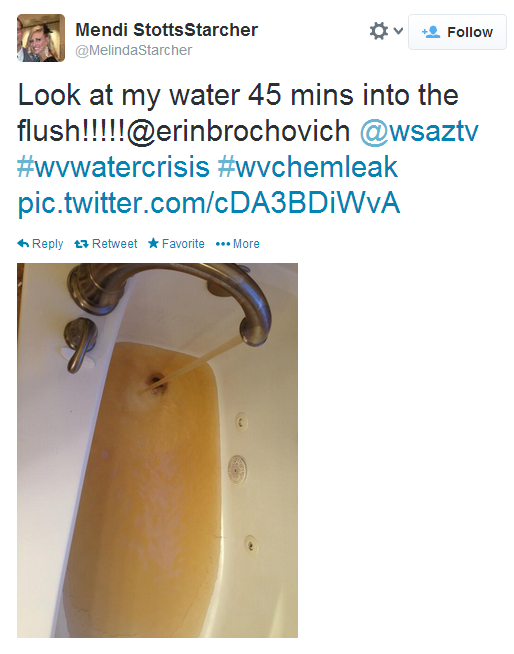 If you are currently unaware of the water crisis in West Virginia, see my article yesterday to get caught up. As I continue my coverage of the West Virginia chemical spill into the Elk River, I feel it is important to give an update that most media isn't talking about. Several people in the supposed "safe zones" still have licorice smell in their water. One picture on Twitter I found showed sludge found in the bottom of a hot water heater. West Virginia American Water (which is a private, for-profit utility company) has been very unclear in what they consider safe levels of drinking water. Several residents in supposed "safe zones" are reporting their water having a thick consistency similar to motor oil even after flushing their water for 45 minutes. Most people I have talked to in WV say they will be avoiding drinking the water for some time. When you consider that most cooking requires water of some kind, this doesn't bode well for local restaurants, among other businesses that were hit hardest by this crisis. All told, the crisis is ongoing, with still no end in sight. As of today, Freedom Industries has been cited for violation at a second facility in Nitro, WV (downriver of Charleston). Freedom Industries had moved their chemical supply to the second location after Thursday's spill. Like the Elk River location, the Nitro location lacks a proper containment wall to prevent chemical spills from leaking. The Nitro location is not on a major body of water. Today, I want people to understand how and why the coal industry in West Virginia became powerful enough that they could store chemicals near a local water supply without proper inspection for over a decade. The truth is, this is anything but a black and white issue. The state of West Virginia, as I'll show, does heavily rely on coal economically. I know most people reading this will be very pro-green liberals (I consider myself among them). Given this, I ask you to approach this article without your preconceived notions. This article does not directly address the large scale environmental impact of coal, as I will leave that for part three. I simply want people to be able to put themselves in the shoes of West Virginians, and understand that we are not uneducated dumb hicks that hate the environment. It is a complicated issue that doesn't allow for clear, clean, and easy solutions. West Virginia Chemical Spill Coverage (Part 1) - What happened? Part 2: Understanding the relationship of West Virginia to the coal industry. Last Thursday, a chemical spill in southern West Virginia resulted in 300,000 residents being told not to use municipal water. The affected area includes the capitol of West Virginia, and its largest city, Charleston. 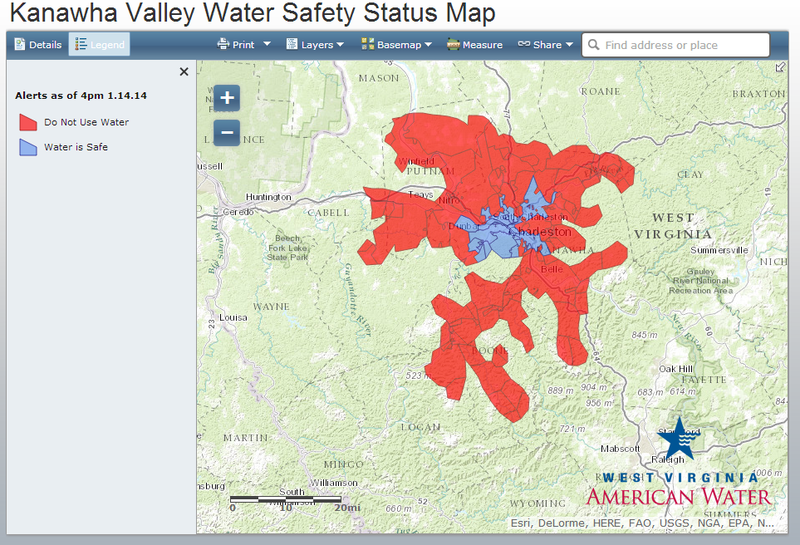 Over the weekend and even until today, much of the area is still under "do not use" orders from the local water company. Many residents are being told their water is now safe after flushing their system by running all faucets and water appliances for several minutes. However, several of these residents are still reporting a licorice-smell to their water that has hung over the city since the chemical leak. So why does some grad student in South Bend, Indiana, care about this chemical spill? To many at the University of Notre Dame, West Virginia may mean little more than that school the Irish beat in 1988 to win the National Champion in college football. However, to me, West Virginia is my home, my friends, and my family. I grew up in Charleston, West Virginia. My parents and siblings live there. And this weekend, I feel I began to appreciate very differently what West Virginia means to me, and why its suffering affects me in a very real way, despite being a long, lonely 7 hour drive away. And as I've spoken with friends, I've realized just how poorly reported this whole situation has been. In this, I feel it is very important to help others understand exactly what to make of this story. I realize many of you won't feel directly affected by this story, and may find it uninteresting. Even my fellow writers may question my decision to write three articles on a topic that is largely alien to our readers. But I think there are important lessons to learn from this chemical spill in West Virginia about energy policy, government regulation, the corrupting influence of money in politics, and, most importantly to me now, the meaning of community. Ultimately, I felt I had too much to say on this issue for one article, so I have broken my coverage of this story into three parts. The first part you are reading now will explain in detail what exactly happened in West Virginia, and what the affects of this chemical spill are. Hopefully, it will correct many misconceptions reported in the news. In part two, I will address my feelings on how and why this chemical spill occurred, as well as why I think this is a bigger story. In part three, I will try to address solutions to ensure these things don't happen again in the future.